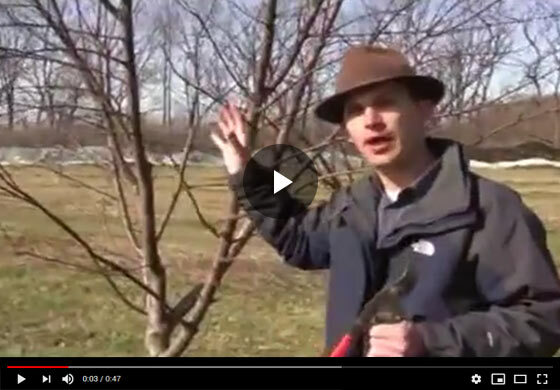 Gurney's horticulture expert Felix prunes an older, neglected peach tree and demonstrates the tips and tricks of reclaiming and reinvigorating out of control and uncared-for stone fruit trees. Hi, Felix here with Gurney's and today we're looking at an older peach tree. This happens to be Flat Wonderful, which is one of our nice, flat, red leaf peaches, it's just excellent to eat. I love this peach tree, but the problem here is that it has been neglected for a couple of years. We haven't pruned it over the last few years very much, not enough and what has happened with this tree, it's so vigorous, It grows so well that all the shoot growth is way up top and remember about peach that the fruit growth is going to happen on last year's growth, and that's all at the top of this tree and it's again, there'll be fruit up there. But to get it, you have to get on a ladder, and we really don't want to do that, and so with proper management as you've seen in some of our other pruning videos and you'll see next year with this tree, you can get all that shoot growth development down low, where you can reach that fruit from the ground and for spraying and care, it's not up top. So what I'm going to do here is I'm going to prune this really hard to get that establishment where we want it - lower, and we'll show the aftermath after I'm done pruning this, and then we'll show you next year what the tree looks like as it grows, so you can see the results. And I want to give you folks confidence when you prune, that you can't kill this tree. What you're doing is you're reinvigorating it and you're getting your shoot and fruit development where you can reach your crop, not up high way where you need a ladder to get to it, so I don't want people to be nervous about cutting back their peach, trees, their charities or their plum trees if they've gotten out of hand like this, it's the right thing to do, folks. I'll show you how to do it. What we're showing here is that it's important not to flip this branch tear, so you want to hold the limb above where you're cutting so you can get a nice flush cut with no bark tear. Alright, so we've taken the bulk of this tree out, as far as the canopy, because we're trying to bring the height down and here in the middle of the tree, remember with the stone fruit, we want a nice open center. It's this leader that has developed something upward growing in the middle, and we don't really want that there because it inhibits the air circulation in the center of the tree. But before I make this cut down here, I'm going to make a nice slant cut here, so the water doesn't sit on the top of that cut, but I've taken most of the weight off of this, so this managing the weight on this primary growth here is a little easier to manage. So we finished that cut here and we have a nice flush surface, single cut, slight slant, so the water can run off. And we've really opened up the center on this Flat Wonderful tree. It's a drastic change, but next year we're going to be rewarded by all the vigorous nice shoot growth we have that's going to bear nice crop for us and it's all going to be up here in reaching distance from us standing on the ground to pick these wonderful Flat Wonderful fruit. So look for that video and don't be intimidated if your tree has gotten out of hand. Your peach, your cherry, your plum tree, you can bring down the size, so your initiation, which is your last year's growth where your fruit is produced, is in reaching distance.